In Making the future: Why we need to help kids make stuff, blogger extraordinaire Anne Collier lays out the case to parents about making, playing, and why it matters. Anne runs NetFamilyNews.org, which provides parents information about technology without the usual fear-mongering so often aimed at parents. Parents and teachers, do you see how central “play” is in all this? This is not rocket science. It’s better and more advanced. It’s childlike. It’s tinkering, messing around with physical and digital tools and media, creative problem-solving that’s both individual and collaborative, trial and error. It comes naturally to children (all of us, really), and I think it’s one reason why they’re so attracted to things like phones and tablets. Of course it needs to be channeled, as authorities are often heard to say, but a better word is facilitated, and the social messing around is part of a progression that researchers call “hanging out, messing around and geeking out” (from the Fab Foundation’s description you can tell that what goes on at the Fab Labs is certainly not all geeking out!). She also graciously mentions our book as a resource for parents and young people. We wrote the book with educators in mind, but have had some wonderful conversations with parents and young people who have found it helpful. One father said to me he actually read one of the examples verbatim from our chapter on “Making the Case: Say This Not That” at a recent school meeting! 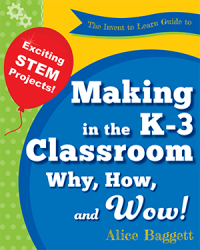 A new book, Invent to Learn: Making, Tinkering, and Engineering in the Classroom, by Sylvia Martinez and Gary Stager helps educators, students and parents make learning by making infinitely more accessible – whether the case for it needs to be made or you get it and now just need the resources – including if your school wants to organize its own Maker Day, which could be so much more inclusive and whole-school than a science fair, as great as those are. Martinez and Stager quote Seymour Papert, the great constructivist and constructionist, as saying, “I think it’s an exaggeration, but there’s a lot of truth in saying that when you go to school, the trauma is that you must stop learning and you must now accept being taught.” So with digital media making and printing, we can join our kids in a playful revolution in learning that depends on hands as well as heads.